Will Ferrell Expands His Comedic Vocabulary with "Casa De Mi Padre"
Will Ferrell’s hoping audiences will find him speaking nothing but Spanish in his latest movie muy cómico. 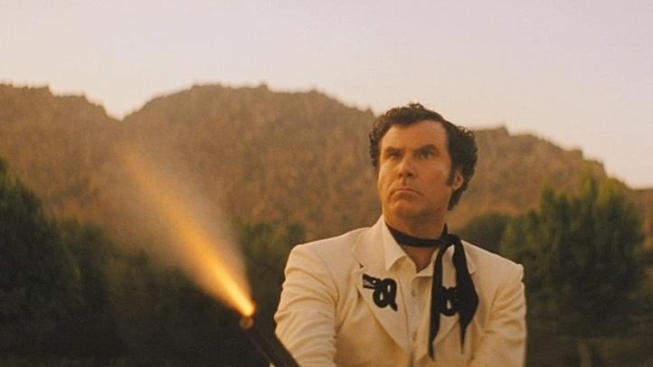 "Casa de mi Padre," an appropriately bizarre, Ferrell-ized take on the traditional telenovela format, casts him as a Mexican rancher caught up in a war to save his homestead and a steamy sexual tension with his brother’s fiancé. And as he tells PopcornBiz, it took more than his smattering of high school Spanish to master a new comedic language for an entire movie. I'll ask the obvious question: What the hell? You know why? For that reaction, literally! I mean, it's something that I knew when the idea hit me that people were going to be sitting around going, "What the hell?" And that gives me such joy. I'm just finding that it's getting more and more fun to do things that are kind of left of center and outside of the norm of what you'd expect, and I think that audiences are looking forward to things that surprise them – or at least I hope so. Is it partly a reaction to how film comedies can get formulaic and typically structured? It didn't manifest itself in a way that was that calculated. It actually just simply hit me as I was watching one of these telenovelas that we've all glanced upon, and stopping and going "God, it's amazing how over-the-top it is!" Watching for a little while and then going, "It'd be funny if I was in the middle of one of those." That's simply how it started. Then from there, once we kind of got the team together with Andrew [Steele] writing it and Matt [Piedmont] directing it, we just started seeing it as a real opportunity to kind of make an anti-movie movie, in a way. Did you learn any Spanish while you were growing up in southern California? I think it's hard not to learn some Spanish growing up in southern California, obviously, and I had my three years of high school Spanish, and I think I had to take a couple of semesters at USC as part of a requirement, but that was it. That was my basic working knowledge, so when this started to take off, it was one of those things where it's so funny in your head and then it's a be-careful-what-you-wish-for scenario because it was like, "Oh – now I actually have to learn the Spanish." So, yeah, that's when it became a bit of a fever dream. I worked with a translator for like a month out in front of shooting, and then he would show up at my house at five in the morning, and we'd drive to wherever our sets were. We shot most of the movie out in Chatsworth, and so he would show up at my house, and we'd just drive for 45 minutes and go over that day's work and then on the way home go over the next day's work. Your co-star Diego Luna said that as a dramatic actor, watching comedic actors like you, the level of conviction and commitment was what he found consistent between drama and comedy. When did you figure that out yourself, staying so committed to the most absurd premise? I learned it pretty quickly. Well, I'll take it back – the stuff that I was a fan of, the comedians that I was a fan of growing up, the Dan Aykroyds of the world, they were people who just fully committed. I just loved how they fully committed to the scene, to their work, so when I started doing sketch comedy at The Groundlings here, when you work with a bunch of funny people you look across the room and you go "Oh, that person is just as funny as me; that person is even funnier, I think" – but I knew the one thing that I would have over anyone is just to commit fully. That was the one thing that I could control, and also it's what I felt made things funny. When it's that real, it starts to become funny, and so I just thought, "Oh, that'll be the one thing that I'll always do. I'll always commit as if I'm giving an award-winning Hamlet speech at the Royal Academy of Shakespeare" – you know, even if I'm playing Mugatu in "Zoolander." However crazy I look or whatever the context, I will always commit fully, and I started having success kind of from the beginning, and it just seemed to work. Are you worried now that going forward you'll be expected to do all your own Spanish dubbing for future movies? I am. I'm worried, but I will be able to charge double. So that's good. "Casa de mi Padre" opens in limited release this Friday, March 16th.